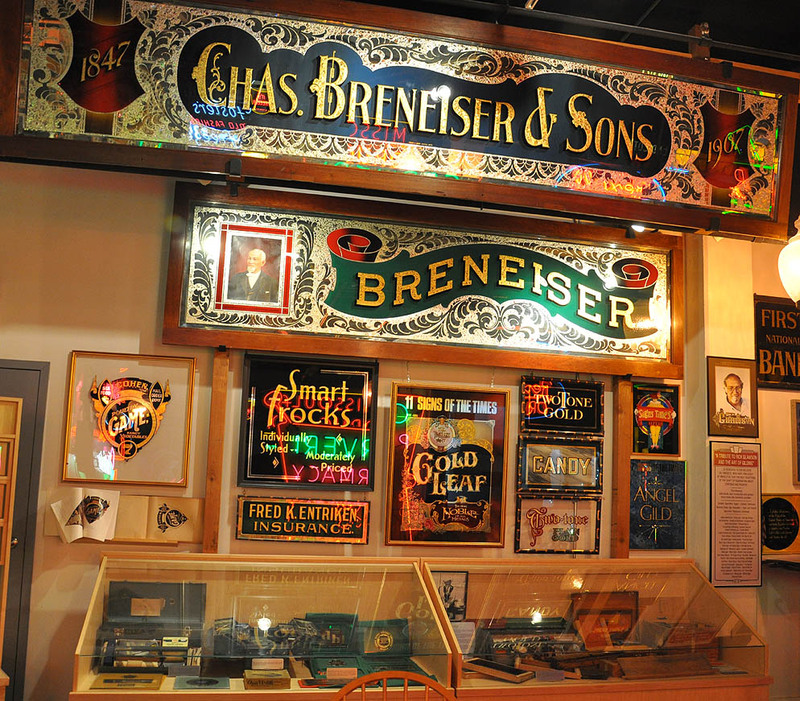 The American Sign Museum in Cincinnati, OH features a dizzying display of about 200 signs from the late nineteenth century through the 1970s. 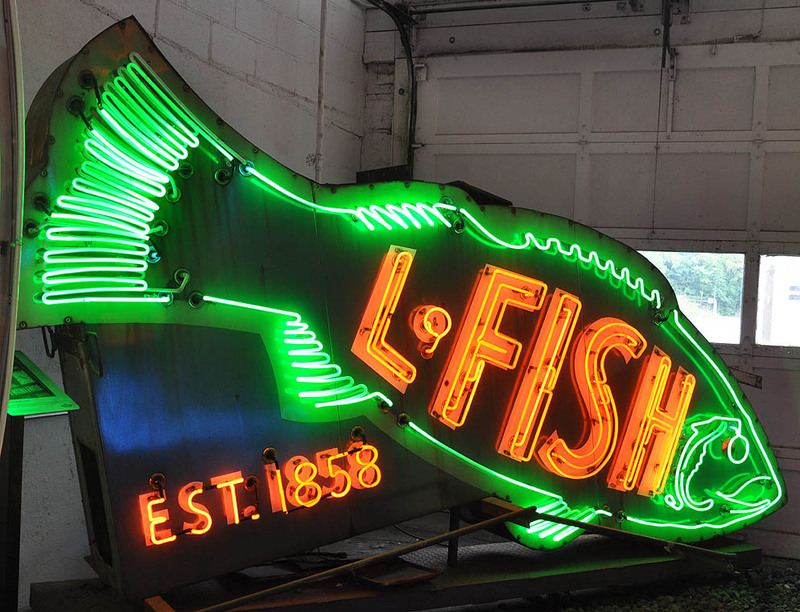 There are incredible fully-functioning neon signs with flashing bulbs. There are also lots of older, pre-neon signs, including some made of wood and other metal signs backlit with bulbs. 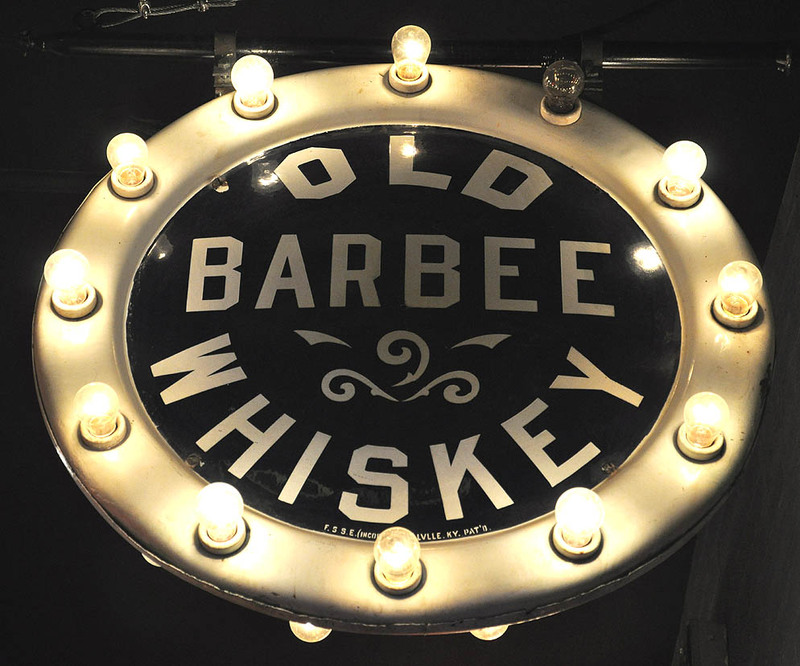 There are examples of intricate gold leaf on glass signs and fun, mid-century plastic signs. There are displays of numerous items related to sign-making such as salesmens' samples and painting kits. The museum's collection spills out into the parking lot with other signs, a giant pig on a trailer, and a giant bowling pin. These signs came from all over the country. Some were purchased but the majority of them were donations. 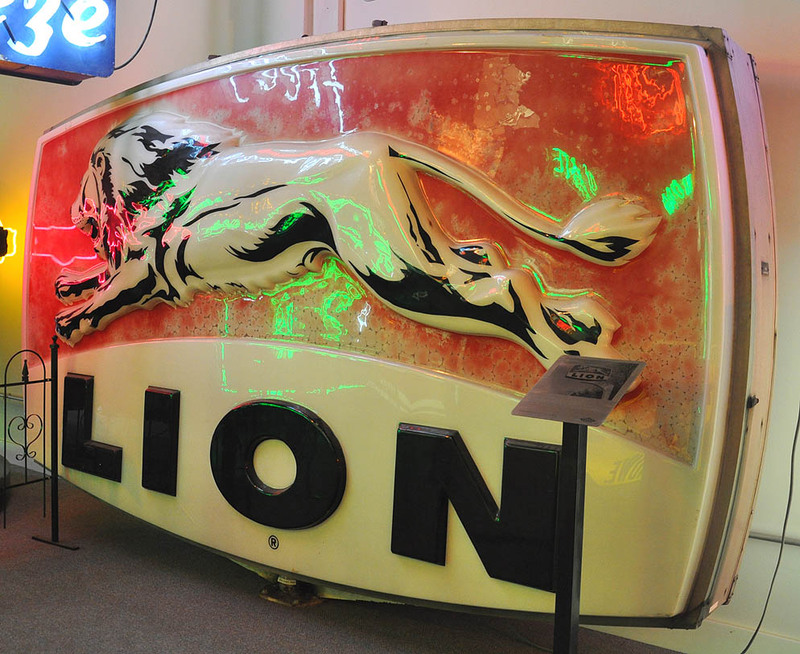 The museum's origins can be traced back to the early 1980s when Rudi Stern encouraged the creation of a neon museum. Stern became famous in the 1970s for his neon artwork. He also established the "Let There Be Neon" gallery in New York City and wrote a book with the same name. Signs of the Times Magazine took an interest in Stern's suggestion. However, nothing came of it until 1999 when Tod Swormstedt made it his life's mission. Signs of the Times Magazine, the leading publication for the sign industry, was founded in 1906. Tod's great-grandfather was the magazine's original editor. Tod's brother, Wade, is the current editor. Tod began working for the magazine in 1975 after graduating college. 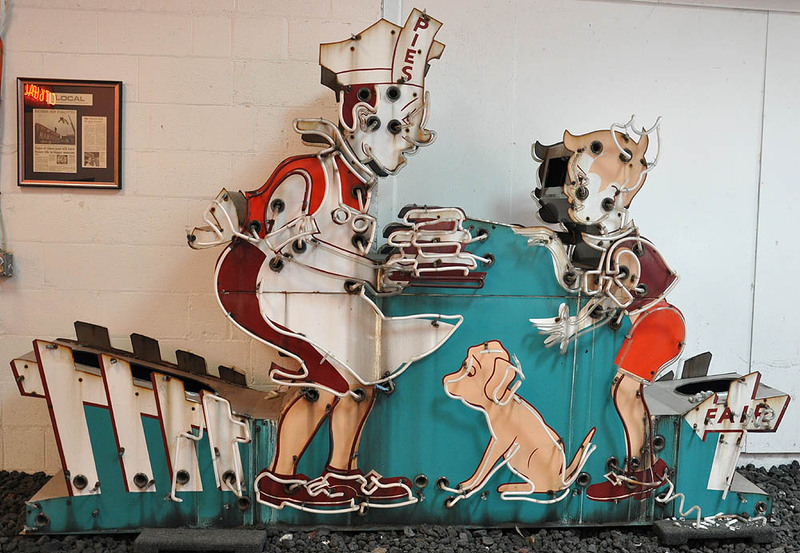 The seed money for the American Sign Museum came from the family's business. The original name was going to be the "National Signs of the Times Museum". 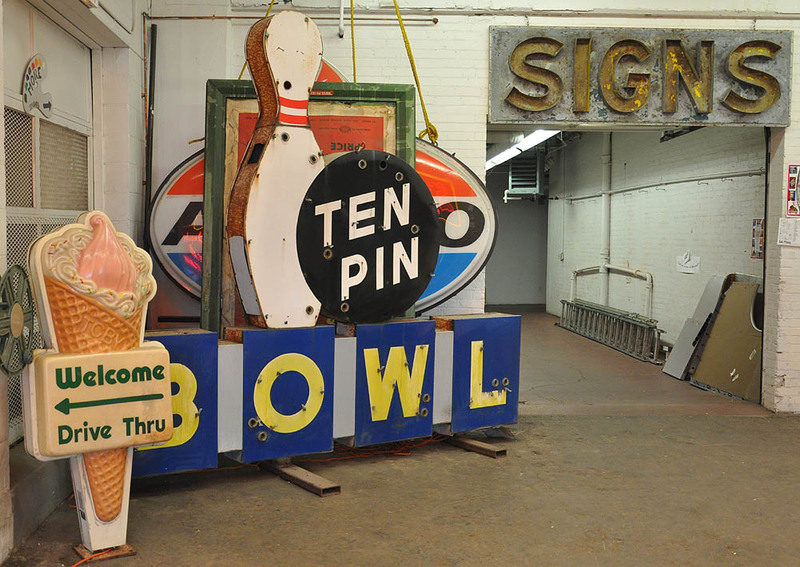 Around 2001, Tod started stashing vintage signs in his basement office at the publication's headquarters. He began the long hunt for a location. Many cities were considered including Los Angeles, New York, Chicago, St. Louis, and Memphis. There was even a false start in Las Vegas. In the end, Tod decided to open the ASM in his hometown of Cincinnati. The Essex Studios location opened in 2005. At that point, the museum was only open on Saturdays and by appointment. Whenever Tod got a call, he dropped what he was doing to give anyone and everyone a private two-hour tour of the collection. The Essex Avenue location was only a rented space. As the collection grew, Tod began looking for a permanent home for the museum. 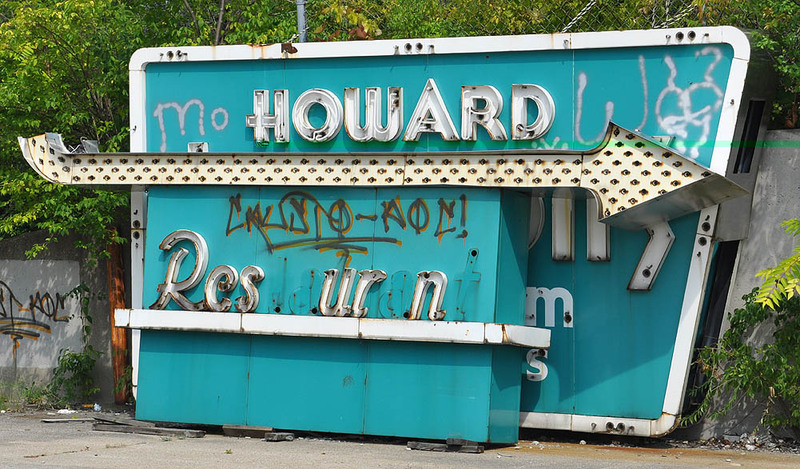 In 2009, he found an ideal building in the Camp Washington neighborhood. The building originally housed a women's clothing factory and later a parachute factory. Approximately $3.2 million was spent to purchase and rehabilitate the building. With more than 42,000 square feet, it was nearly ten times larger than the Essex location. The 28 foot tall ceilings allow the huge Howard Johnson's restaurant and McDonalds "Speedee" signs to be displayed indoors. The new location opened in 2012. More than 19,000 square feet is used to display the collection. The building also houses "Neonworks", a neon shop that restores local signs and maintains the museum's collection. The rest of the building will be used for offices, a conference room, a library, and possibly a temporary exhibit space. The museum's archives contain thousands of items such as photos, books, catalogs, design sketches, sign-making materials, and tools. The central feature of the museum's display space is the "Main Street" area. It is a reminder of what downtowns used to look like when nearly every business featured an electric or neon sign. Three months before the museum reopened, a team of 29 sign painters from around the United States and Canada was assembled. These highly skilled signmakers created details for the simulated storefronts. Gold leaf and hand-painted signs were added to doors and windows of the jewelry, hardware, TV repair, barber, and pizza shops. The storefronts are five feet deep which allows the contents in the display windows to be changed from the inside. The museum's signs are only gently restored. Broken neon tubing and bulbs are replaced to make them functional again. However the signs' patina and imperfections are considered part of their history. Descriptive plaques are installed in front of the signs to explain where they came from and any facts that are known about them. A hand-painted Mail Pouch Tobacco sign serves as the backdrop for the museum's event space. The fifty foot long sign was removed from a dilapidated barn in Lanesville, Indiana and reassembled, slat by slat. The event space holds up to 800 people. It is used for conferences, weddings, and other private events. This rental income helps with the museum's operating expenses. 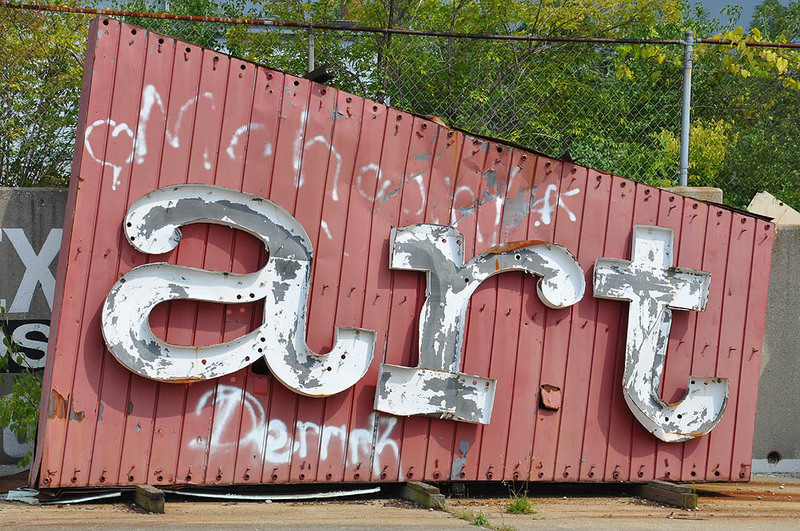 The American Sign Museum is a non-profit organization. It would never have opened without generous donations from the sign industry and sign enthusiasts. A twenty-foot tall, former Carpeteria statue has stood over the museum's entrance since it opened. A second statue which had been in storage was installed in 2016 at the museum's other entrance. 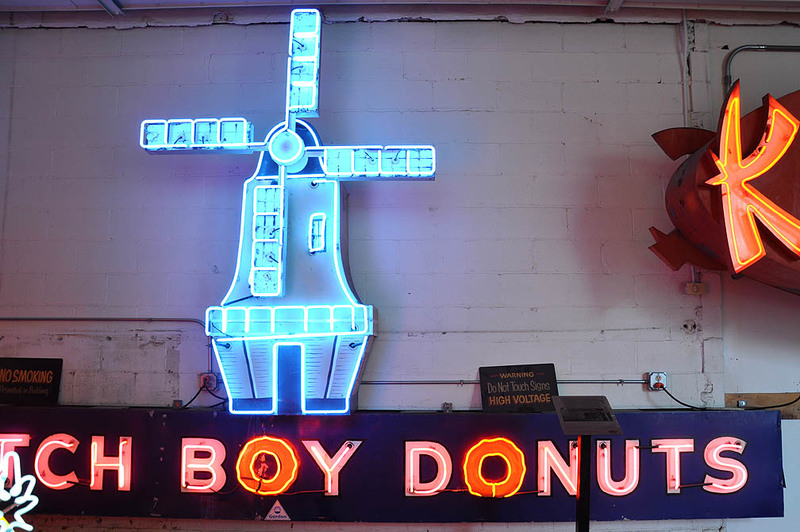 For more, see the American Sign Museum's website.